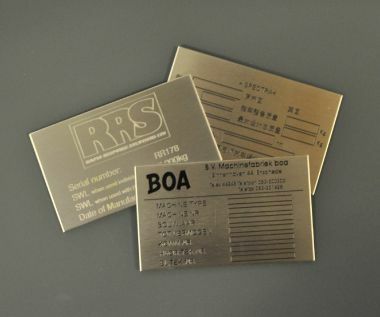 Steel Industrial Serial Labels, measuring 50mm x 25mm x 1.00mm and supplied with bur-free straight edges, ideal for adding your company details to any equipment supplied. The steel used is a 316 grade, DP1 finish, ideally suited to exterior use and conditions such as harsh / salt water environments, long life applications and where cleaness is an important factor. Artwork etched into the surface to leave a long lasting contrast image or one colour infil if required. Stainless Steel Serial Plates can be supplied with 2 or 4 x 3mm fixing holes, self-adhesive or without any fixings.